The team gathers for a photo under the field goal before their practice ends. The varsity team had 24 players in total; one freshman, four sophomores, four juniors and 15 seniors. Fifteen seniors, eleven wins and one field. 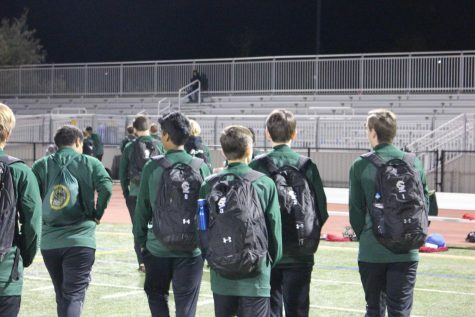 As varsity soccer ended their season, they said goodbye to 15 players; who are moving onto bigger and better things. These are the players who are graduating in June, but not without leaving their legacy on the field. Adam Salter strikes the ball into the goal during practice. Salter has been playing center back since the start of his soccer career. Adam Salter has been playing for 14 years and has played all four years in high school for Sage Creek. He enjoys going to the beach, hanging out with my friends and spending time with his family. He has played center back since he was a kid and it stuck with him throughout his career. After graduation, he is planning on going to college and playing intramural soccer. What did you enjoy most about playing this season? How do you think you’ve improved this season versus last season? What will you miss most about playing for Sage Creek? What are you looking forward to after graduation? Alex Heller has been playing soccer for 10 years. This year he played midfield, but outside of soccer, he enjoys skiing. After graduation, he plans on going to college somewhere in California and will also continue his soccer career by playing intramural. How do you think you’ve improved from last season? What will you miss most about playing with Sage Creek? What are you looking forward to most about graduation? Players walk together onto their side of the field before the game begins. Before each game, the coach and their players have a motivational meeting to prep for the game. Aryan Pandhare has been playing soccer for thirteen years. He has also played golf, but he enjoys playing soccer more. Pandhare played left wing, right wing and center mid. He plans on going to a college after graduation and getting his degree. He also plans to continue playing intramural soccer. Will you miss playing with Sage Creek? What are you looking forward to most after you graduate? Beck Rinks has been playing soccer since he was in first grade. He also enjoys playing volleyball, going to the beach, body surfing, metal detecting and playing video games. He played multiple positions this season including center forward, right wing, center wing and also went for a lot of the corners. After graduation, Rinks does not plan on playing soccer in college but hopes to join an intramural team while also studying mechanical engineering. How do you think this season differed from last season? What are you looking forward to most about graduating? 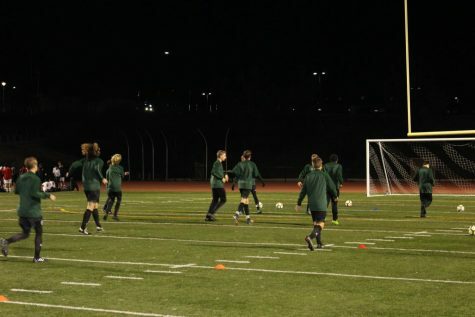 The team practices their drills before their game begins. During their league, the team’s record was 4-4-2. Danny Rubin started playing soccer when he was in kindergarten and continued to play all the way up to eighth grade. Rubin then focused on cross country, until this year where he joined the varsity soccer team. This season he played mostly forward, however, he has also played mid and forward mid. He also enjoys surfing with his cousin, fishing in lagoons and, if he gets lucky, out on a boat. After graduation, Rubin is planning on attending college while also potentially participating in track and field in college. If not, then he plans on playing intramural soccer. How have you improved this season versus last season? What will you most about playing with Sage Creek? Garrett Edwards has played club soccer for around seven to eight years while also playing in high school for three years. Edwards also enjoys surfing and playing both indoor and beach volleyball. He has played indoor volleyball at Sage Creek for four years, as well as beach for three years. In his soccer career, Edwards started out playing defense, then continued to forward and played that position for most of the season. After graduation, Edwards will not partake in soccer at his college, however, he might play in a club while studying health sciences. How have you improved this season vs last season? What will you miss most about playing at Sage Creek? Players run drills during practice in preparation of their playoff games. 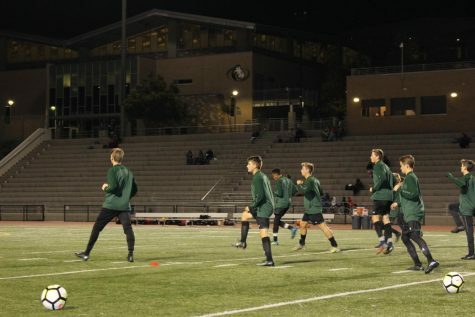 Last year varsity boys soccer won the CIF championship against West Hills. Gavin Goddard has been playing soccer for 13 years. Goddard also enjoys surfing and running cross-country. 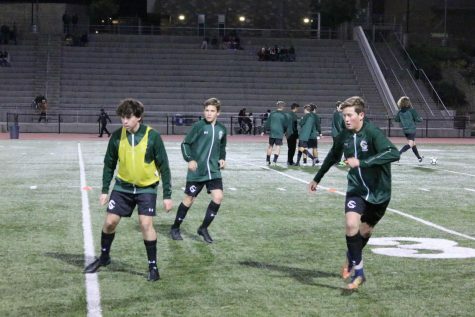 This season, he played center defensive mid and after high school, he plans on attending a four-year college and will probably continue his soccer career by playing intramural soccer. What did you enjoy most about this season? How do you think you have improved this season versus last season? What will you miss most about this season? 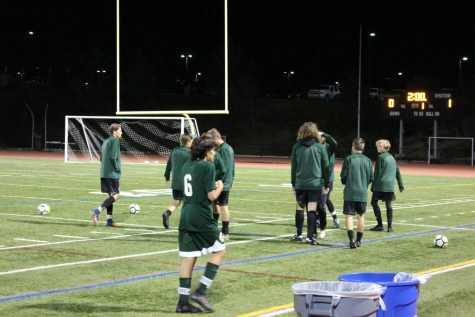 Harrison Logan has been playing soccer for 13 years and has played for Sage Creek all four years of high school. He also enjoys fishing, playing piano and partaking in Young Life. This year he played center back, however, his first three years he was a center defender. How do you think you have improved this season vs last season? 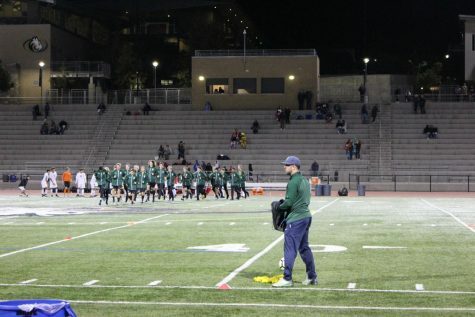 Coach Neil Keith watches his players run laps around the soccer field whilst warming up for practice. Jackson Ginn has been playing soccer since he was six years old. He also enjoys playing volleyball and golf. This season he played center mid, and after graduation, he plans on attending a 4-year university where he will also partake in intramural soccer. Jet Trask has been playing soccer since he was 5-years-old. When he’s not playing soccer, he also enjoys playing baseball and hanging out with his friends. This season he played center mid, and after high school is planning on continuing his soccer career at Sacramento State. What did you enjoy most about playing the season? How do you think you’ve improved this season vs last season? Players walk back onto the field after a brief pep talk with their coach. This season, boys varsity soccer has had an overall record of 11-8-3. Owen Damitz has been playing soccer for 14 years. When he is not playing soccer he enjoys playing video games with friends and playing beach volleyball. This season, Damitz was a goalie. After graduation, Damitz is planning on going to a 4-year college where he will not be playing for the school, however, he will probably join an intramural team. Titus Washington has been playing soccer for 11 years. Washington has dedicated most of his life to soccer, although he did play t-ball for a small time. This season, he played striker up top. After graduation, Washington will attend Sacramento State where he will continue his soccer career while also studying business and marketing. How do you think you’ve improved the season versus last season? The team prepares for the playoffs by stretching before their practice. 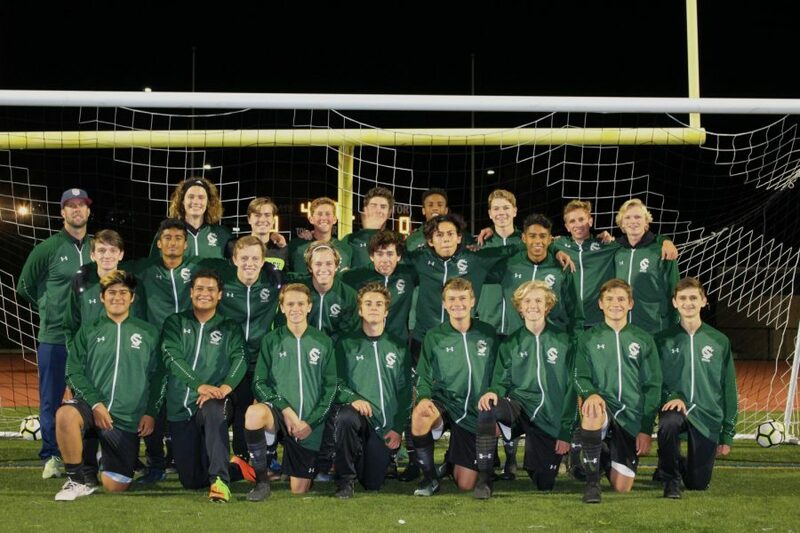 They lost their playoff game against West Hills by a score of 3-1. Xavier Salazar smiles for the camera while stretching with his teammates. This season Salazar played as defensive midfield for varsity soccer. 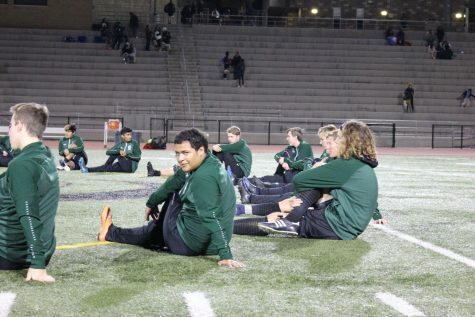 Xavier Salazar has been playing soccer for all four years in high school and has also partaken in Wave for five years. Outside of soccer, he enjoys golfing, surfing and fishing. This season he played many positions around the field, but mainly defensive midfield. Salazar plans on attending community college for two years, then transferring to a UC and becoming a firefighter. However, he does not intend on continuing his soccer career after graduation. Zach Schubert has been playing soccer since he was 4-years-old. Along with soccer, he also enjoys playing lacrosse, going to the beach, hiking, playing video games and keeping himself busy. 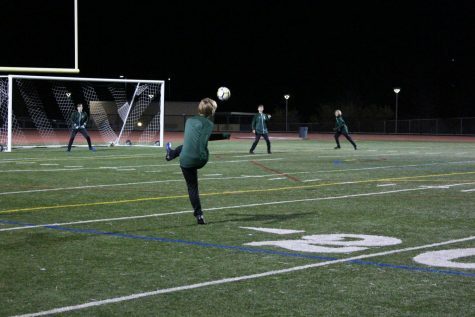 Although he has mainly played lacrosse for Sage Creek, he has partaken in club soccer at the beginning of high school. This season Schubert played defensive on the right side. After graduation, Schubert plans on going to college and studying engineering. What will you miss most about playing a Sage Creek? Editor’s note: The original version of this article had quotes associated with Aryan Pandhare’s name. It was brought to our attention that he was not the one who said them. Since then, he has been interviewed, and the article has been updated to reflect the correct information. Great content Lilly and Phoenix! Easily the best post on The Sage. This article, and especially the answers to the interviewer’s questions, shows a lot of honesty individually and collectively shows great teamwork! !